Having worked for Tracks4Africa for more than 10 years, I finally had the chance to explore the much talked about country of Namibia. Best of all, with my family and friends in tow. On the travel cards? A two-week camping trip to southern Namibia. 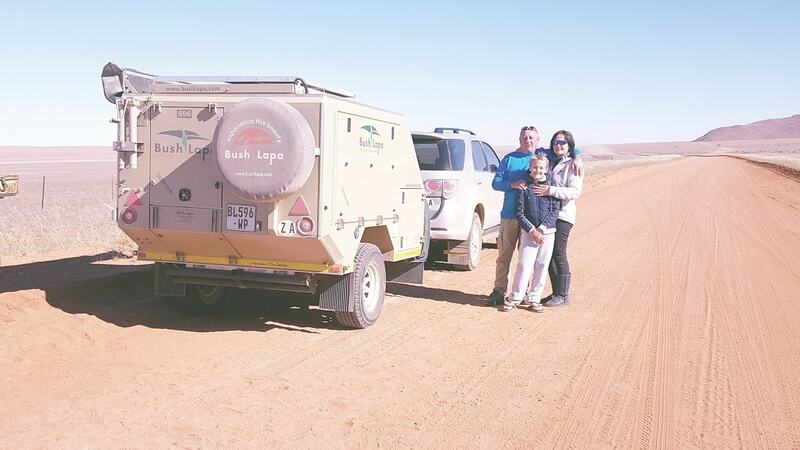 Equipped with notes and tons of research, including Tracks4Africa’s GPS Maps, Guide App, Namibia Self-Drive Guide Book, the Namibia paper map and atlas, I felt confident and informed. How would my expectations, preconceptions and notions compare to the real deal? During our trip, our friends were quite intrigued by my know-how, constantly questioning the source of my new-found knowledge. I would simply answer: “Tracks4Africa, of course!” I’m really not being biased when I stress the value of T4A’s products. For a change, I was on the ground and not behind a desk, and these tools proved invaluable. Although some of my travel tips might seem obvious to the seasoned traveller, this was all very new to me. Our journey into Namibia began by crossing the border at Vioolsdrift. 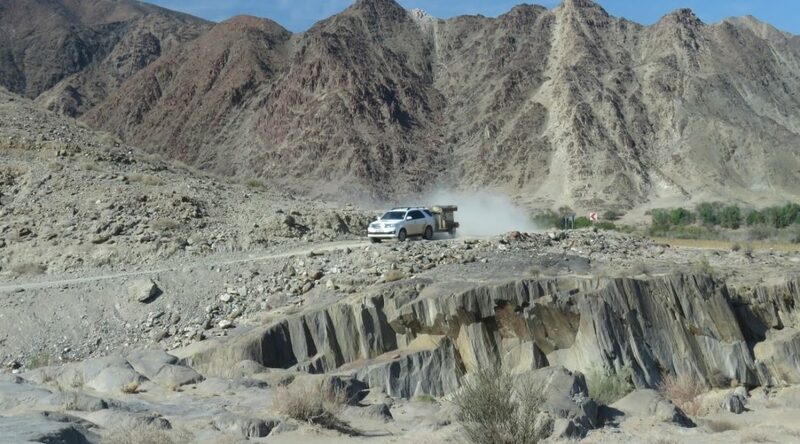 From here we travelled to Aussenkehr and Rosh Pinah along the C13 through |Ai-|Ais/Richtersveld Transfrontier Park. The vastness and aridness of Namibia’s countryside had me hooked – instantly. The C13 is a stunning route that shoulders the beautiful Gariep River for kilometres on end with hardly any vehicles in sight. We found a lovely picnic spot right next to the river – thanks to the T4A Guide App. Blissfully unaware, we almost drove past this scenic picnic spot just off the C13 on the Gariep River. 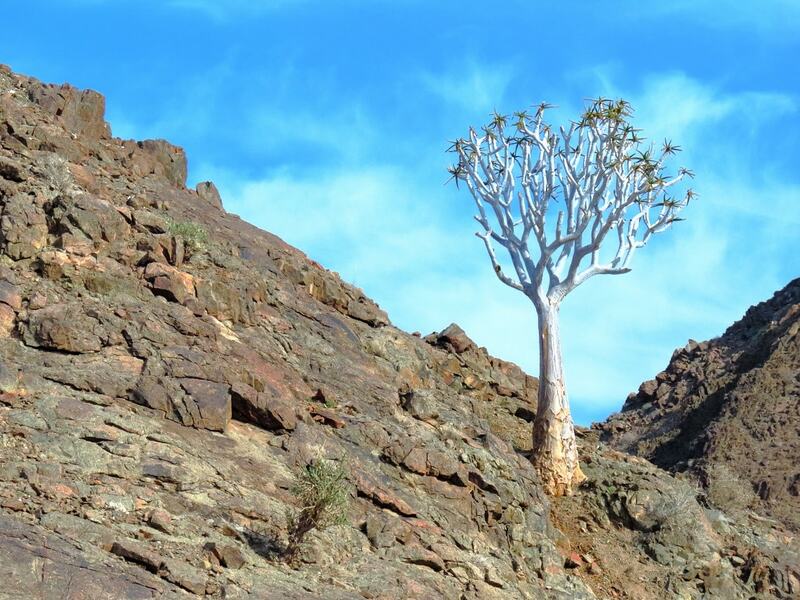 A quiver tree along the C13 in |Ai-|Ais/Richtersveld Transfrontier Park. 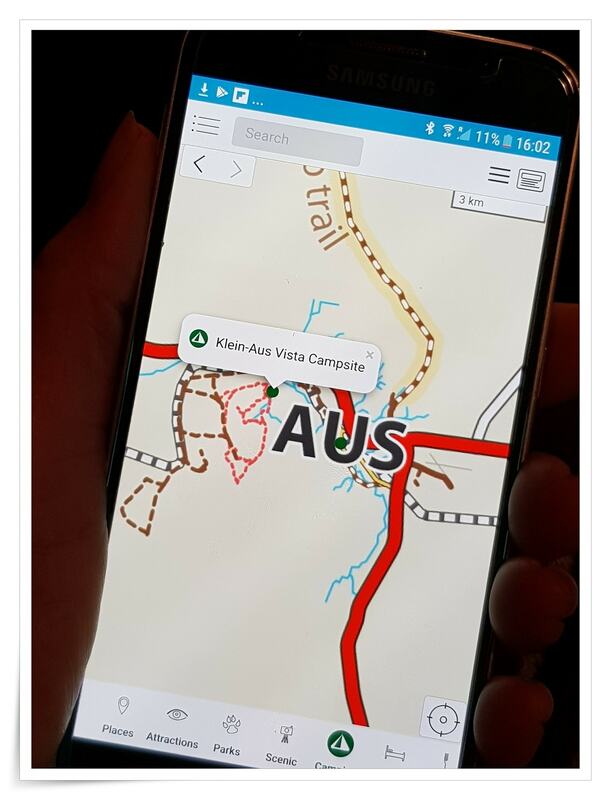 Using the T4A Guide App, I could orientate myself as to where exactly Klein-Aus Vista Campsite was situated. 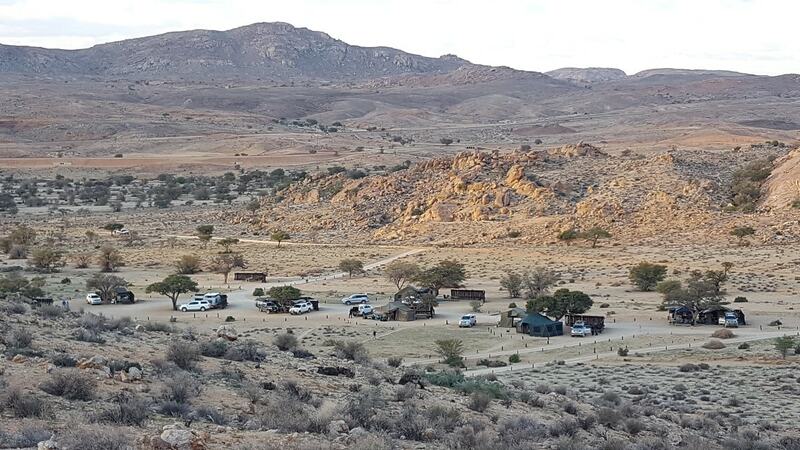 One of our first camping spots near Aus, Klein-Aus Vista Campsite, was exactly how I pictured Namibia’s campsites: clean, small, quiet and completely surrounded by nature. We called this camp home for two nights. The solitude and nothingness of Klein-Aus were pure bliss. Make your camping as simple as possible. We had the bare minimum to unpack and repack. We planned carefully how and what we packed in our trailer and in our car’s boot. It really makes a huge difference when camping at a different place every second or third night. I found that planning and doing some preliminary research on tourist attractions – what to see and where, and where you can purchase what – helps a great deal. What’s the best time to visit certain hotspots? What time do these attractions open and close? The latter can have a big impact on your daily schedule, especially if you are staying for limited time periods at specific places. Also, knowing the distances and travel times between places helps you plan. I spent quite a bit of time on Basecamp (free Garmin software) doing some trip planning on our T4A GPS Maps. 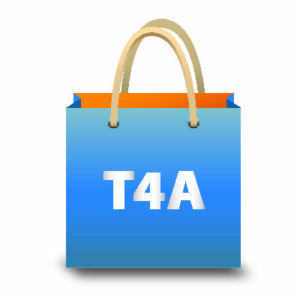 Using Basecamp, you can cleverly determine travel times and distances on T4A’s GPS Maps. T4A’s Traveller’s Atlas Southern Africa provided invaluable information about services at specific destinations and border control times – to mention but a few. Sights aplenty: feral horses near Aus, the ghost town of Kolmanskop, and Lüderitz. Feral horses: To view these wild and wonderful beauties from a special viewing hide, sunrise (around 08:00 during winter months) or sunset proves best. Kolmanskop: You will need a permit to visit Kolmanskuppe which can be purchased at the entrance gate – you can park inside. 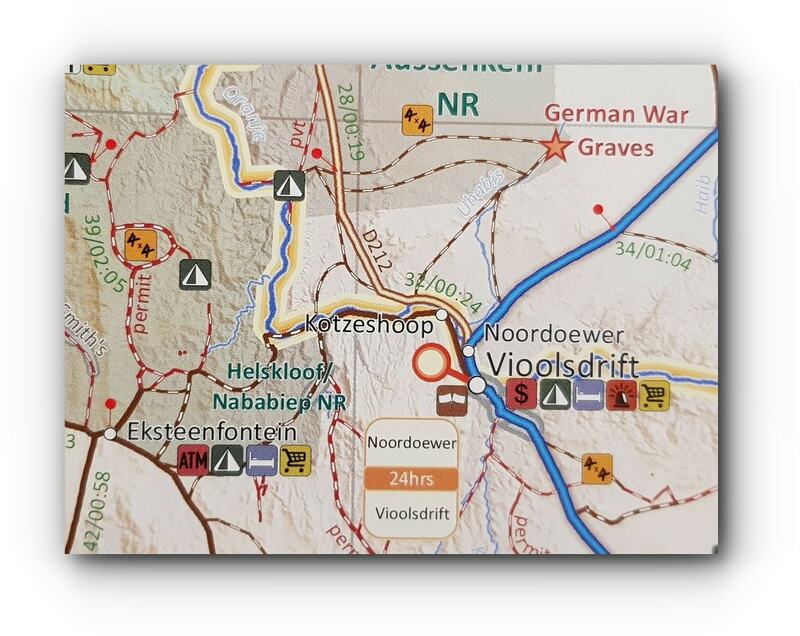 Take note that the historic site is only open until 13:00. A photographer’s permit can be obtained at the gate’s office a day earlier (at an extra cost), which gives one access to Kolmanskop from before sunrise to after sunset. 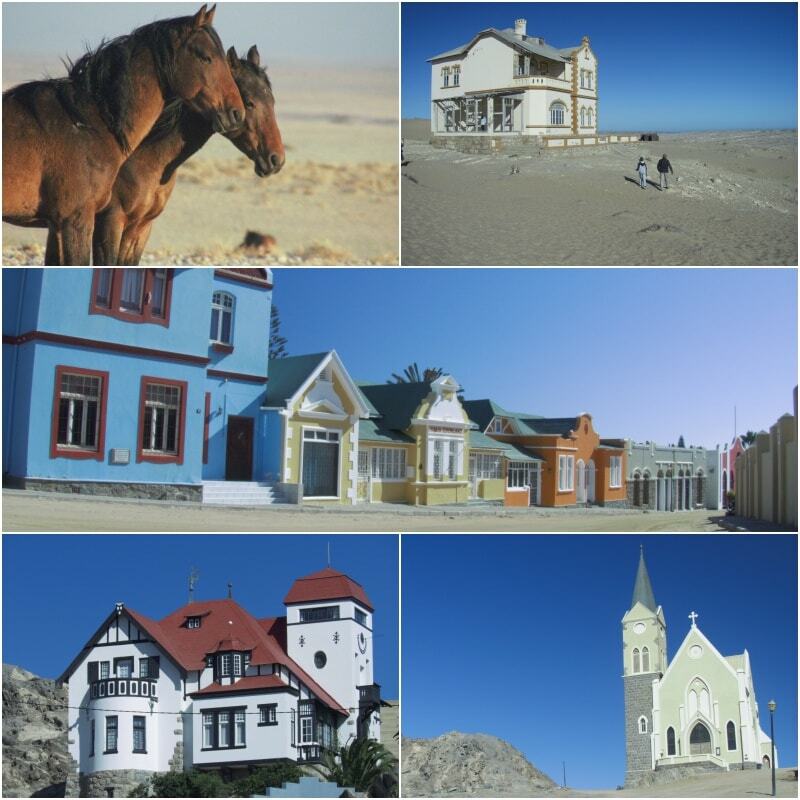 Lüderitz: Since this is quite a big town, it’s good to get a lowdown on the main attractions – we visited Haus Goerke (an extravagant mansion built in 1910) and the highest building in town, Church on the Rocks. 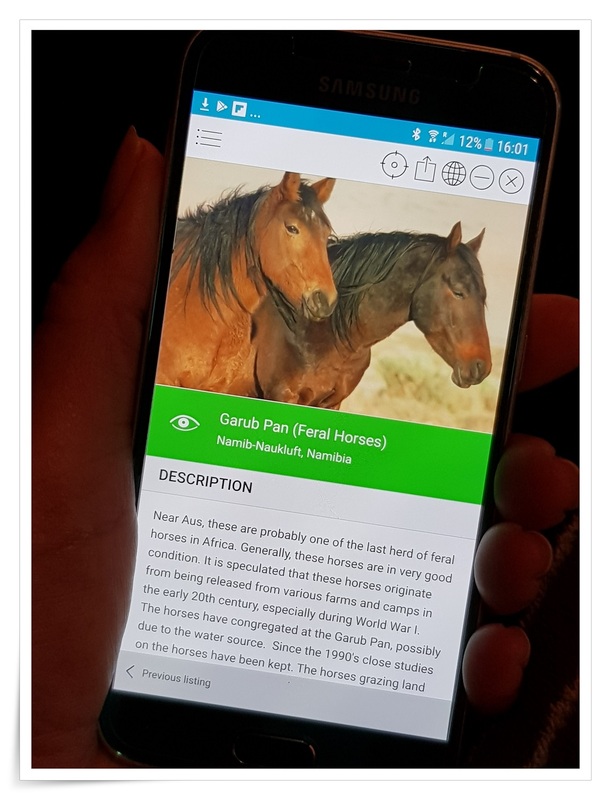 More on Aus’ horses on the T4A Guide App. 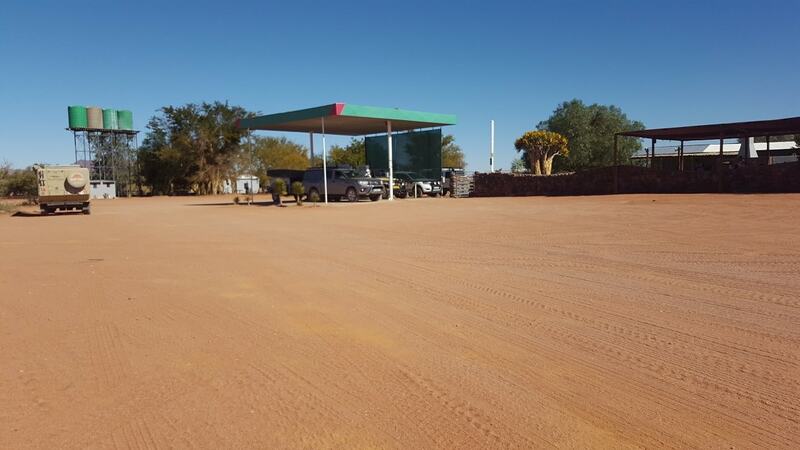 Since it was our first time in Namibia, fuel stops and the availability thereof had us worried. We decided to fill our tanks whenever we had the chance. Travelling informed with T4A products, we knew where we would find the next fuel stop. We found we could pay with a credit card everywhere. 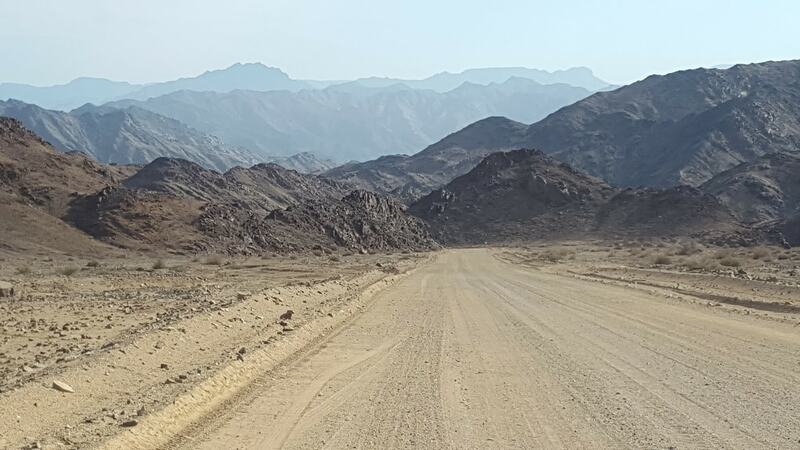 In the middle of nowhere, travelling through the Namib-Naukluft National Park, you can fill up in Betta – a farm situated at a strategic point where the road from Duwisib Castle joins the C27 from Helmeringhausen/Sesriem. The farmer has put up a 24-hour fuel stop. Good to know! 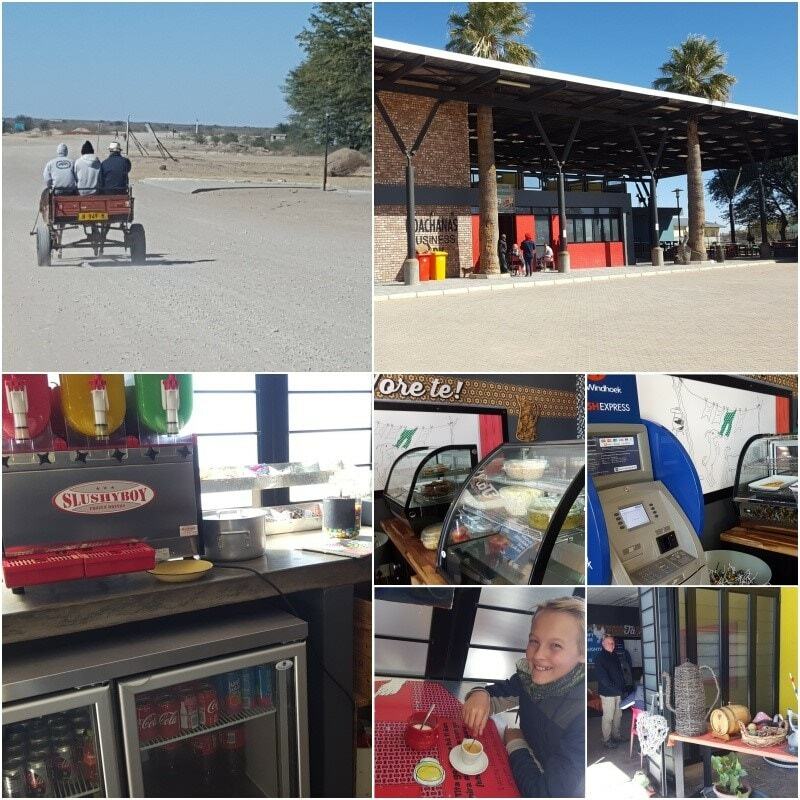 With kilometres of endless gravel roads, you hardly expect to find a place that is going to sell lovely cappuccinos or scrumptious apple tarts, pies and cakes. Well, at the small town of Solitaire in the Namib-Naukluft region, you’ll be pleasantly surprised. En route from Dordabis to Stampriet on the C15, we came across an unexpected little ‘business park’ in the one-horse town of Hoachanas. A quaint coffee shop sells meals, coffees, cooldrinks and even Slush Puppies. The little town of Hoachanas delights. Stay away from popular places in season: Ai-Ais Hotsprings Resort Campsite, a stunner, was overcrowded and noisy. 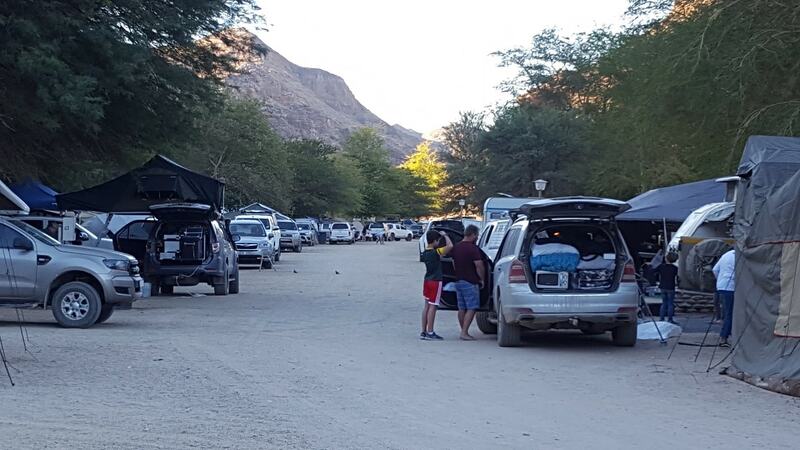 A crowded Ai-Ais Hotsprings Resort Campsite during the July school holidays. I found Namibia to be safe and the people very friendly – it was a wonderful experience and I cannot wait to return. Next time I will definitely spend more nights at one place. 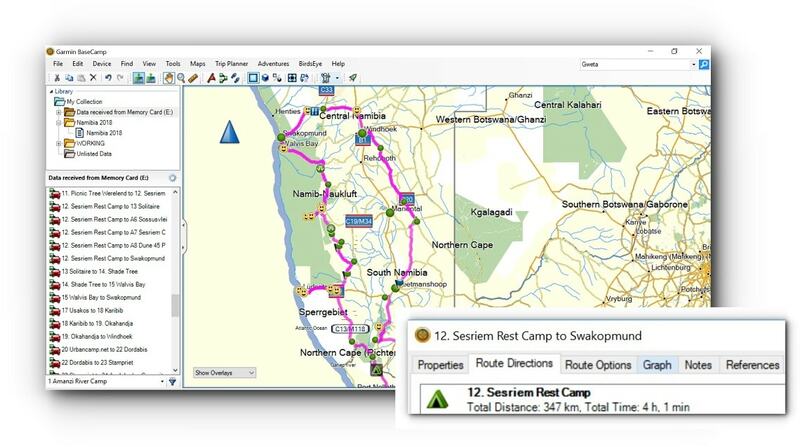 I’ll also be far more confident knowing the true value of Tracks4Africa’s range of navigation products. Most importantly, I won’t linger so long to discover Africa’s beauty. Next on my Namibia bucket list? Etosha! 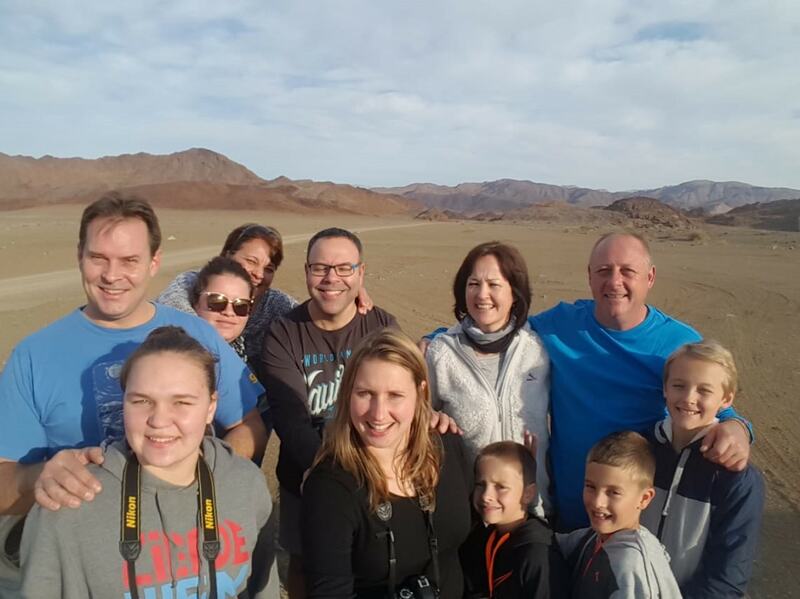 The three travelling families: the Bothas, Potgieters and Reynekes. We love Namibia, despite living in Europe we have visited this magnificent country eight times already. Our absolute favorite part is Kaokoland (northern Namibia). towards Palmwag you sometimes wonder if you are driving on the planet Mars. There were times we only saw two or three other cars in a week’s time. Hoanib river, build a campfire at night and gaze in complete silence at the starry skies. Just come back from a stunning trip, husband and friends hiked the Fish River Canyon then on to the Richtersveld. This was our 4th trip, planning the Cunene and Epupa Falls for next year. Carol that is wonderful! Sjoe – so many places to go and see in Namibia! Yes Namibia is a fantastic destination…my favourite. Just did a 2 week trip as well in the south….again.. Yes you can get fuel with a credit card almost everywhere…though Betta took cash only. We are doing a very similar trip leaving 01/09/2018, I cant believe you sent this today. Gets me so excited. I can hardly wait!!!! thanks for the insights and the information about the fuel is useful. You are going to love it!! and will just want to plan the next one very soon again! enjoy every minute!